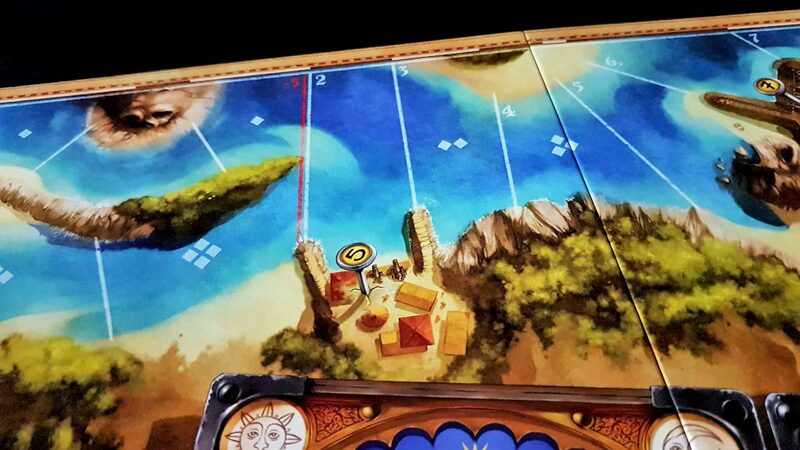 Fast, pacey and full of anarchic energy – Jamaica is a very likeable game that blends just enough decision making with just enough randomness to satisfy. We gave it three and a half stars in our review although we accept the possibility that some portion of that score may be the result of a subconscious Swashbuckler Multiplier. Seriously, I’d give a mugging two stars if my attacker was wearing a pirate costume. Let’s put my personal issues aside for a moment though and talk about Jamaica’s accessibility. I’m hoping for a whole array of tentative recommendations here, because a pirate’s first love is the C.
However, these are only used to track player position around the island and can be substituted with more visually distinctive markers if necessary. This will come of course at a cost of the aesthetics of play. Jamaica is a beautiful game, and that visually striking appeal is going to be significantly diminished if ships are replaced with, for example, the Scottie dog from your spare Monopoly set. Overall then, we offer a recommendation here because the game is entirely playable if you’re willing to swap out your ship tokens for something else. It’s far from ideal though, so that recommendation gets a little minus added to the end. As is usually the case in circumstances of total blindness the game will be unplayable without support out of the box. Since it requires each player to have a hidden hand as well as hidden treasures that’s going to cause some issues. The contrast isn’t terrible (the ratio is 2.2:1 for the example I mentioned above) but it’s not great and is often embedded into a busy background. Familiarity will ease the symptoms of this problem. Again, the game is beautiful and this kind of thing is the reason why. That beauty though has an accessibility impact. I’ve played with people that genuinely didn’t see the pins. 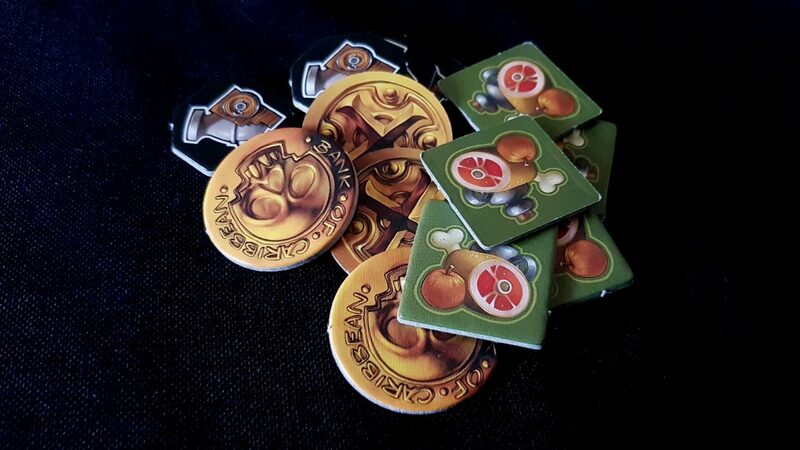 Not only are the food markers poorly contrasted (down to a 1.4:1 ratio in places), the port gold markers are quite small and difficult to make out in a busy board. Point values as you reach the home stretch of water leading to the end are difficult to read too, but that’s a problem solved by the table as a whole at the end of play. The dice at least are standard d6s for day and night actions, and are basically d6x2 for the combat dice. Accessible variants will work here although you’ll need three of them and enough room to roll and place them. They’re a shared resource too, so they’ll need to be accessible in a way that works for everyone at the table. In terms of the tokens at least there’s a positive story – they are different form factors and can easily be identified by touch and feel. When they’re arranged in the holds of a ship they can be checked by rifling through the stacks. 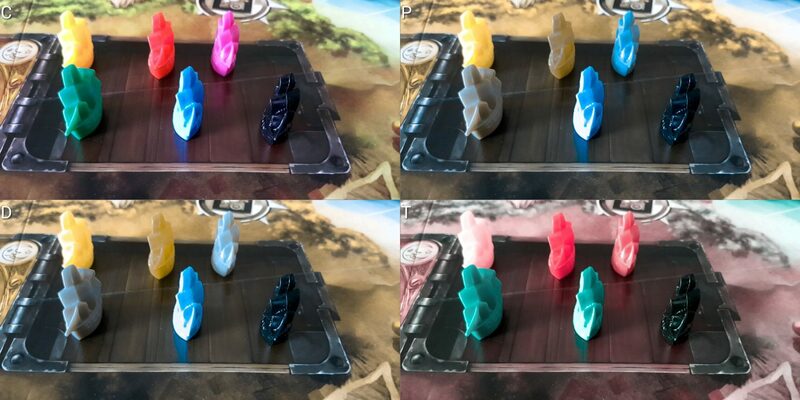 Even if playing completely sightlessly the ship management is possible to handle – while the holds themselves might not be very visually accessible given the low contrast between compartments all you really need to know is that there are five separate stacks (six with a treasure) and you need to distribute new goods into a non allocated pile. In the end though at the heart of Jamaica is the assessment of cards against dice against the state of the board and none of that is particularly easy to do if visual impairments are to be considered. It’s not an overly large map, but it is still four-fold and dense with information. It’s true you only have to consider six possibilities in total at any one time, but you also need to have a handle on what other people might be doing and where they might be going. Overall then, we don’t recommend Jamaica in this category. Jamaica is primarily a game of selecting a branch of action from a restricted set of options. You have three cards and you might be responsible for choosing the order of two dice. Everything else plays out with sedate inevitability unless there’s a battle. The cognitive cost for the current first player is somewhat greater than it is for everyone else, but even then you’re just considering between six possible actions and picking the one you like. That is in itself a task of considering the cards that have been played and the routes that people have been taking. Each player has the same set of actions and if you’re paying attention you’ll be able to work out what options each player theoretically has available even if you won’t necessarily know what they have in their hand. That allows you to throw a perimeter around the possibility space and begin assigning mental probabilities to outcomes. Costly, if you want to play well. On to that there’s a degree of pattern manipulation you’ll need to do to line things up the right way. We’re not talking Patchwork levels here but spatial intelligence definitely plays a role. It’s not an overly cumbersome process but it also ties in to issues of left-to-right discrimination – you’ll need to do a number of mental rotations to calculate the impact of a move depending on from what perspective you’re viewing the board. If your ship is on the far side of the board from your cards and the dice are rolled opposite you you need to be able to not only mentally rotate the allocated dice but assess their impact on the board with another rotation and then relate both of those to your cards. That may sounds like an oddly specific comment to make but it’s estimated that around twenty percent of the population have difficulty in reliably discriminating left from right. When it comes to loading actions you need to place goods in an empty hold. If you throw goods overboard it can’t be of the type you just took on. The result is a constant sliding puzzle of logistics where you attempt to make sure you have the right blend of food, gold and gunpowder for your immediate and future needs. It might seem like Jamaica is a game driven primarily by luck but there is quite a lot more to it than that if you want to play at peak performance. It puts considerable pressure on card selection and even more on memorising the state of the decks around the board. There’s no reading level associated with play, which is good, but there’s an associated level of numeracy that must be mastered both in terms of allocation and arithmetic. There’s also a shifting value proposition that must be considered as doubloons become more important the closer you get to the end – you need food to make the bulk of the journey but each doubloon is a victory point in the end reckoning. Scoring is a matter of arithmetic too but it can be handled by a single player without serious game impact. So we ask our usual question here – does the game require people to think deeply about what they are doing? If everyone is playing just for the joy of it rather than the conquest does it still hold up? I think it does, yes – you can focus on the task in front of you rather than on the branching possibility space of the game mechanics and still have an enjoyably chaotic time. It’ll be much harder to pull off the interesting combos and to have the game state bend in your favour but you’ll still get a lot of the fun of play. Spatial elements are still going to matter, but the rest of it is largely optional if all you want to do is sail some ships around an island. Overall then we’ll offer a tentative recommendation in this category for fluid intelligence, and a more solid recommendation for memory. However, as above, that’s dependent on everyone loosening up and not aggressively playing to win. As is often the case if everyone gets into the fun of things this is a hilarious game full of good-natured backstabbing. That’s state of mind isn’t always going to be possible though when dealing with emotional control issues and associated conditions. So, what does Jamaica have in store for someone that may find it difficult to keep a temper or modulating moods under control? First you have the lowest tier of competition – over resources. Food, gold and cannon powder are all pretty much functionality unlimited – you’re unlikely to find yourself unable to pick up tokens because of the actions of another person. I mean, I haven’t counted the tokens and crunched the math but it’s not something that’s going to come up often. There’s no real issue in collecting resources from the endless bounty of the sea and nobody can stop you doing it. There’s no problem there. The treasures are available only for the first person that collects them, and while they are sometimes curses they are more often something nice. You don’t get to choose the treasure, but statistically speaking over the long haul it’s likely to be more good than bad. That’s also not a major source of problems. The problem comes later when you have something especially nice that other people might like. In combat you can lose your most precious possessions as a result of an unlucky roll. The more you pick up, the more likely you’ll be a target. Doubloons are transferable victory points and the special power treasures you have are there for everyone to see. Gunpowder is used to slant the odds in your favour during combat but it’s used up in the process. If two or three people come by to pick your ship clean you’ll find your ability to defend yourself diminishes rapidly as you use up resources. The game doesn’t explicitly encourage this kind of ganging up but it certainly incentivises it in competitive games. Then the play of cards themselves can be frustrating since if you don’t get the dice you want you may have to burn a good card on a suboptimal action. If there are double ones on the board and all you have are loading actions and a full hold you’ll need to empty one of them to pick up a single unit of something you may not even want. That can happen turn after turn if the dice don’t roll well or are allocated in a way that doesn’t work for you. The card-play hugely mitigates the arbitrary randomness of these kind of games but it doesn’t solve the sometimes anthropomorphically malevolent impact of misfortune. Your failure is sometimes, but not always, arbitrary. There’s scope for serious score disparity too depending on how the winds of fate fill your sails. You might find yourself forced to move backwards when everyone else is soaring forwards, and if you don’t cross into the home stretch you will find yourself beginning the score calculation with a penalty of five points. Treasures and gold increase your score but it’s possible if you are unlucky to end up on negative points while other players are in the 20s and 30s. Randomness is a great leveler when it’s left in its raw form in a game, but when you have tools for mitigating it you lose the comforting sense that in the end you were merely a victim of the dice. In Jamaica it’s up to you to marshal your resources in the most effective way and everyone is working with not only the same set of cards but also the same rolled numbers. It’s hard in those circumstances to put too much emphasis on the dice trying to kill you. If you get in a rut too you might find yourself unable to make progress no matter what you do. 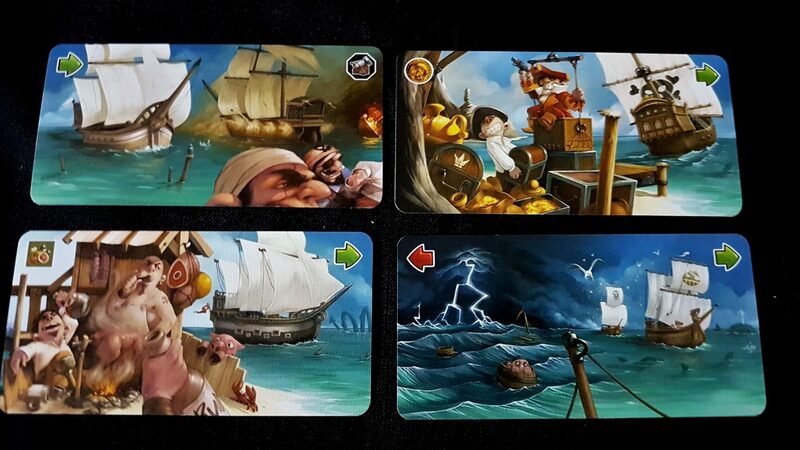 If you have no food and no ability to load it (because those cards may have been used, as an example) you might find yourself mostly adrift. You might move forwards into unaffordable spaces only to be kicked back to where you started. The shuffle of inventory means that you might not even be able to easily fix it without taking a serious penalty. The cost to enter spaces increases the closer you get to the finish line too which means that if you don’t solve your resource problem early you’ll find yourself locked out of the higher scoring end squares. Those are the three cards I pulled randomly from the deck to discuss how ruts manifest. For the first, if a five isn’t the die placed down on the morning square I’ll end up where I started, albeit with more food at the end of it. For the second, I can get by with picking up five gold and moving two or picking up any amount of gold and moving five. Picking up five gold and then moving more than one square will get me to the next port. For the last card, if I don’t have a five for the first or the second I’m again ending up exactly where I started. Whatever card I play here, the one that next comes in to my hand joins two options that already weren’t ideal. Looking forward to my next draw from the deck it would be ‘forward and then back’. That card is, regardless what I do, going to end me where I started at best. You can spend several turns becalmed if you allow yourself to fall into this situation, and it’s largely your own fault for not planning ahead. In the end though if you don’t have the cards and you don’t have the rolls there isn’t much you can do. You have to live with the lasting legacy of your mistakes. Now, all of this has to be taken in context – Jamaica is a very light-hearted game and this kind of self-inflicted wound is part of the comedy. There is nothing in the game’s theme that makes this seem like anything other than a kind of Caribbean farce. We can’t always choose what we are going to get upset about though especially when considering the emotional control issues that are germane to these teardowns. We’ll still offer a recommendation (just) here for Jamaica, but as usual – bear this in mind before deciding it’s time to play. Physical accessibility is something of an issue for several reasons. 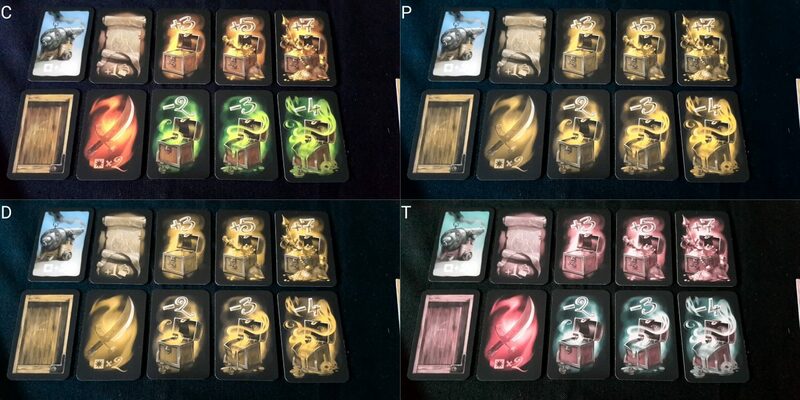 The first of these is that each player has their own deck and will shuffle through this several times during the game. The cards are awkwardly shaped and sized and there aren’t enough of them to permit a comfortable overhand or rifle shuffle. The shuffle difficulty is certainly not on a par with a deck-builder in terms of hand maintenance, but it will come up as an issue. Players hold a secret hand of cards – there are only three of these but again the non-standard form factor makes this more awkward than it needs to be. A standard card holder likely won’t be appropriate since you’ll probably only manage to fit one card per holder. As such, hiding cards or indicating which are to be played might be a problem. 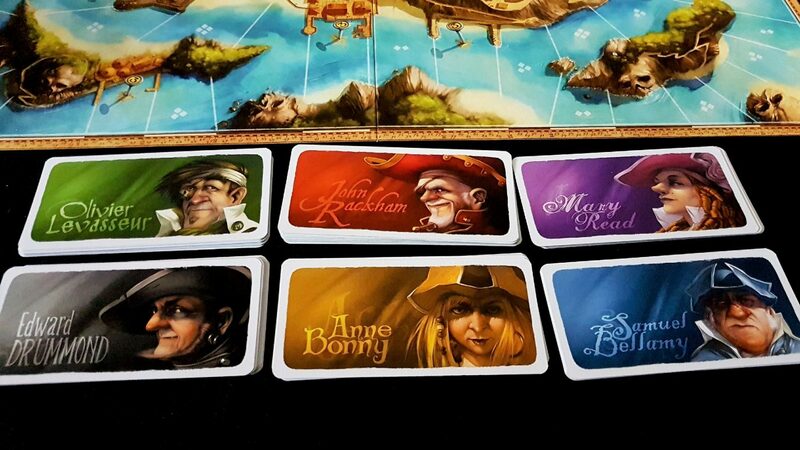 There’s a lot of collecting and distributing tokens too, as well as moving ships around the board. The latter at least can be handled by another player without game impact, but collecting tokens from multiple holds might be a little more cumbersome for a second party to do considering how often it has to be performed. There is some dice rolling but it can be handled by a second party if necessary. And that player manual – God. It folds out like a treasure map which makes sense give the theme but creates a physically inaccessible monstrosity that sacrifices utility for aesthetics. I hate it so much. Here it is below with a ship hold for scale. The game does lend itself well to verbalisation generally since the movement is either ‘forwards’ or ‘backwards’ with the occasional choice at a branch in the route. Everything else is unambiguous based on the dice and cards played. Even the holds are numbered, so you can say ‘load that into hold four’ and the game rules handle the rest. Overall we’ll offer a tentative recommendation in this category – it’s fully playable with verbalisation but if that is not a desirable option it’s likely to raise some problems for all categories of physical impairment. It’s absolutely fine here – there’s no reading level associated other than learning the rules, and no need for explicit communication during the game. You can play in silence if you like, although obviously each session is much improved with the adoption of a wildly unrealistic pirate accent and associated mannerisms. We’ll strongly recommend Jamaica in this category. Jamaica makes an effort to include women in its roster of pirates – the gender balance isn’t 50/50 but it is drawing from a historical well for its characters and there are only a few other women pirates I could name and none that I would expect most people to know. The historical context too is tightened because an effort has been made to choose pirates that are roughly contemporaneous with each other. Given that, the mix seems reasonable. There’s more of a missed opportunity when it comes to representing the fascinating geodiversity of the period. Black Ceasar, Miguel Enriquez, John Julian and more would have been interesting inclusions to the roster and all would have been in keeping with the time period. 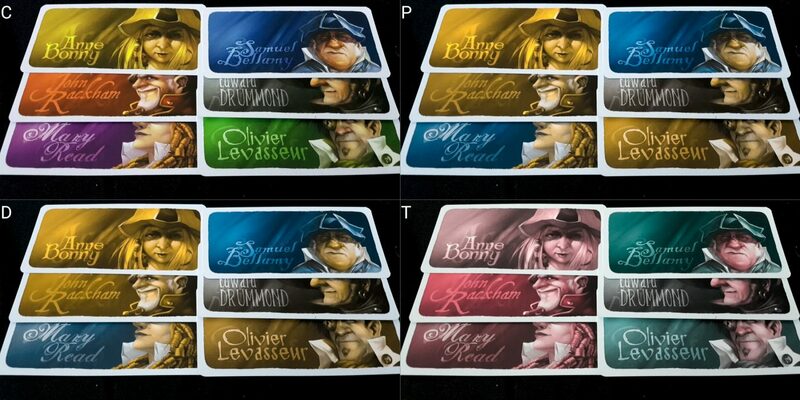 As it is we have one Frenchman (Levasseur) and five pirates from Great Britain and Ireland. This is the Caribbean after all – it would have been nice to see more than a roster of white Europeans dominating the cast. Merchants and Marauders still remains an excellent example of how to do the diversity of the golden age of piracy well and it would have been great to see Jamaica doing something like this. Similarly with Merchants and Marauders I am going to note, but suggest you ignore, that this is a game that completely glosses over the historical legacy of piracy by turning its protagonists into cheerful figures of fun. Pirates are legitimately romantic anti-heroes in modern times, cut off as they are from the brutal impact of their actions. This is not a perspective that holds true across all cultures. It really doesn’t bother me at all, but there are others than would prefer not to glorify or sanitise the legacy of sea-borne terrorists. This is true in the same way some people wouldn’t wish to give the cool sheen of glamourized Hollywood violence to modern criminals in the Mafia. 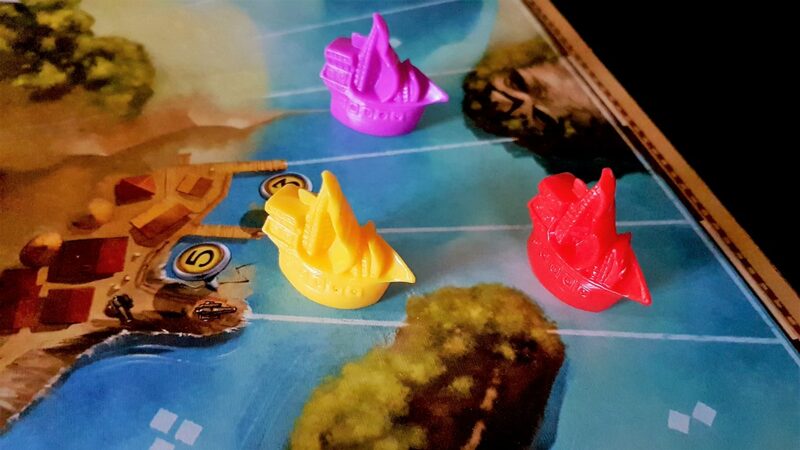 Jamaica supports from between two to six players, although with two you’ll be making use of a dummy ‘ghost ship’ to add the necessary contention over resources. This isn’t ideal, but it’s still entirely playable and enjoyable with two players – more is definitely better though. At an RRP of £35 that gives the game a ‘price per player’ of approximately £5.80 which is pretty good value. It plays quickly and easily, and is something that relatively young children can play with much older grand-parents with everyone having fun. 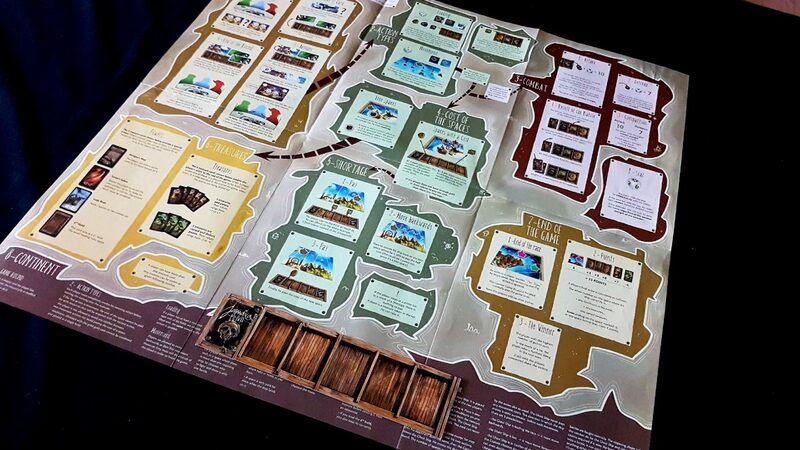 It won’t be a regular core of your gaming experience, but it is a good candidate for filling a pirate shaped hole in your collection for situations in which Merchants and Marauders is just too much to consider. Overall, we’ll recommend Jamaica in this category. The issue of secret hands is going to cause a problem when dealing with intersections of visual, physical or cognitive impairment because the act of asking for help is going to end up leaking game information. The cards are straightforward enough in and of themselves to be reasonably easy to understand but the combination of these elements is going to have an impact. This is especially true when the implication of die rolls has to be considered across multiple cards, and in varied allocation. 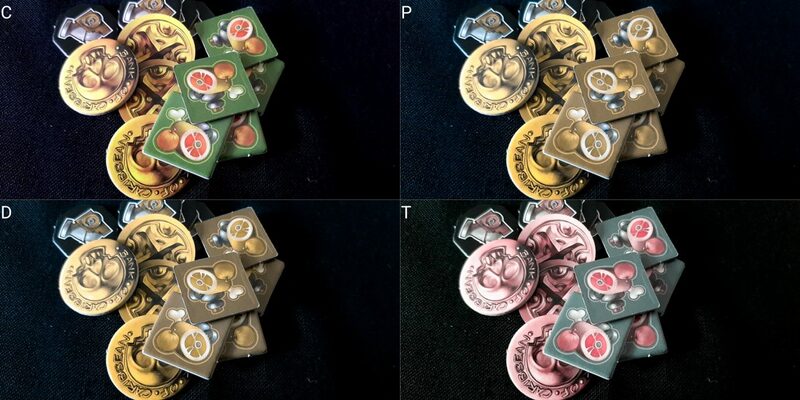 When player movement triggers payment penalties it’s important to know where a ship will end up after it’s all over – that’s a key aspect of tactical play and it needs players to relate their cards to the dice to the board and to the other players. That’s difficult to do visually or cognitively already, but especially so when both categories of impairment must be considered in conjunction. Play is interleaved, with everyone playing their cards down simultaneously and then resolving the outcome. This ensures that everyone has reason to be interested all the time – issues of emotional control or attention should be well catered for here. And while everyone is involved all the time the game plays reasonably quickly and shouldn’t be so long as to risk exacerbating issues of discomfort. The box suggests between thirty and sixty minutes and that seems in the right ball-park to me. Obviously as accessibility compensations are made the play-time will increase but overall the game doesn’t overstay its welcome. However, if discomfort should become an issue during play it’s reasonably easy to quickly house-rule a compensation – there are rules in the box for a ‘ghost ship’ that takes a meaningful role in play but works according to a set algorithm. If dropping out from a three or higher player count game a ship can be commandeered by ghosts and worked according to this system. It won’t be quite as good as having a real player there, but dulls the impact of someone dropping out of play and reduces the likelihood that they feel the need to suffer through to the end so as not to disappoint anyone. Jamaica in terms of its accessibility is a blend of the good, the not-so-good, and the bad. In that respect it’s like many of the games we consider here on Meeple Like Us. A number of the problems are down to carelessness in design. That is always somewhat frustrating to see. Colour blindness isn’t considered in the ship palettes. The card forms are unnecessarily awkward and uncomfortable for everyone to shuffle. And that manual. Yeesh. 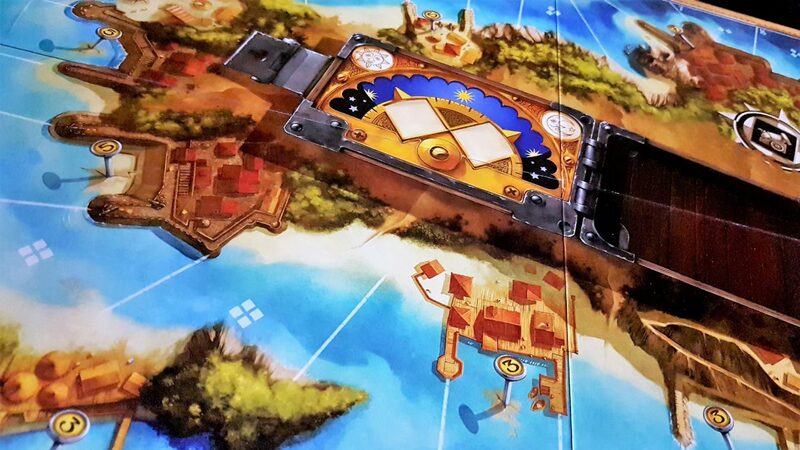 Jamaica is a light and breezy game that has a lot of charm – we liked it enough to give it three and a half stars in our review. If it looks from this profile like you could play it you could certainly do a lot worse with your time and money. Certainly if it’s been a while since you gave your swash a damn good buckle.